How many times have you brought fresh herbs and spices only to watch them spoil and rot in your fridge? Never again! These storage tips will definitely help you store your spices for days. • Avoid storing dried herbs and spices next to the stove, as heat, air, and bright light will destroy the flavor of spices. Always store your spices in a cool, dry, and dark place. 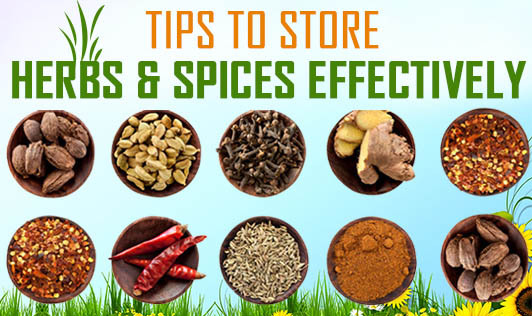 • Use tightly-covered containers to store dry herbs and spices. • Use your spices within one year. • Rub your dry spices in your palm. If you don't smell the aroma of the spice, then replace them with new ones. • Snip the herb stems before refrigerating. • Increase the shelf-life of your herbs by freezing or drying them. You can freeze the fresh herbs directly in a freezer bag or freeze them in an ice cube tray and then store the ice cubes in a freezer bag. • Do not empty spices directly from the container into a steaming hot pot. The steam from the pot may clump the spice and spoil it quickly. • Always use a dry spoon to remove the required portion of spice. These tips will definitely help you retain the flavors of your spice for long.